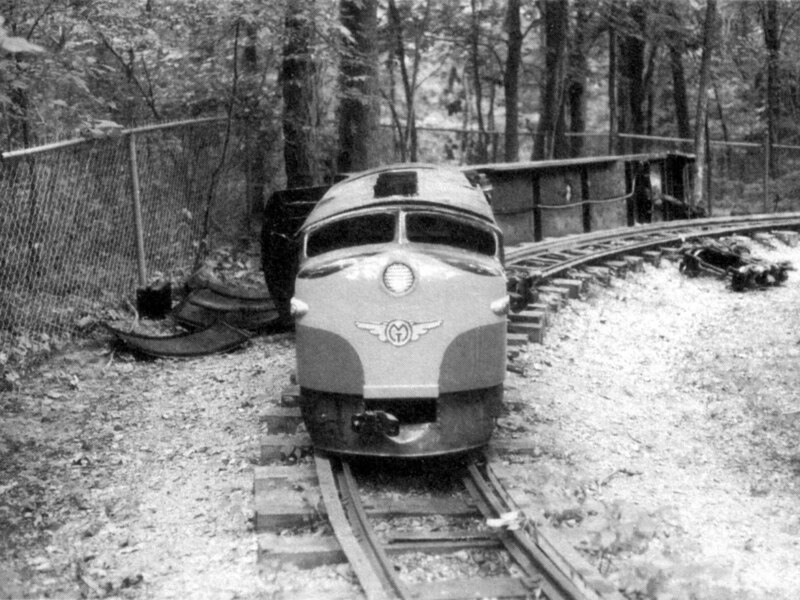 On Thursday, August 11th, 1996, 4-year-old Emily Hunt was paralyzed from the chest down and her 57-year-old grandmother, Nancy Jones was killed after the miniature train ride at the Old Indiana Fun Park derailed and overturned as it approached a curve. The two victims were crushed under the weight of the cars . Upon investigation, the train was traveling much faster than its design speed of 12 miles per hour. The ride operator claimed to have applied the brakes as the train neared the curve, but it was discovered that many of the ride’s brakes were either broken, missing, or not connected, and that most of the anti-derailment devices were missing. The speedometer was broken, along with the governor, which limits the speed of the train. The track was littered with broken ride parts. Unbelievably the ride passed two state inspections in the 3-month period prior to the accident – before the safety inspector admitted that he was not qualified to inspect amusement rides. A state review of the park’s own records showed that the train had derailed 79 times in the 2 months prior to the accident, and as many as nine times in a single day. The train after the derailment, as photographed by the Boone County Sheriff’s Department. Emily’s grandmother was killed and Emily injured when the car they were riding in tipped over on the curve and they hit the stand of trees along the track. 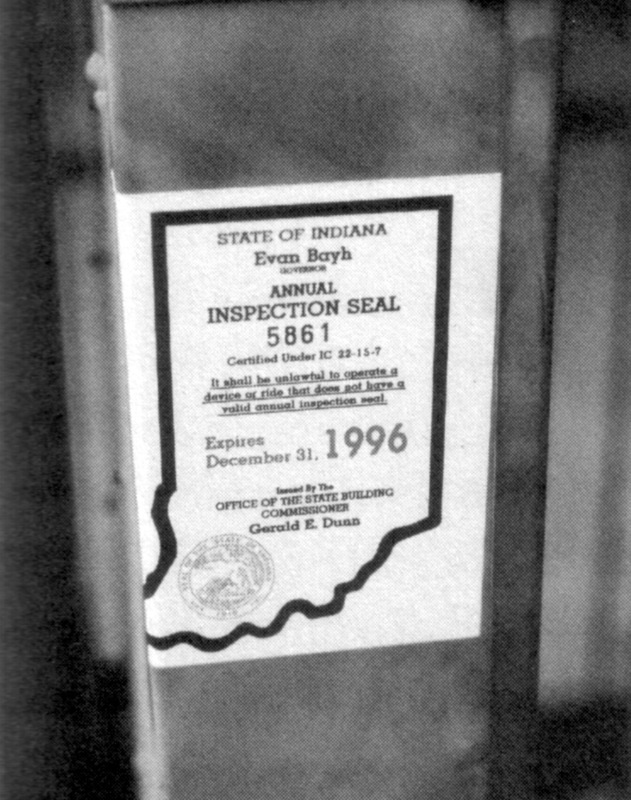 The 1996 Indiana inspection seal certifying the ride was safe. The support buildings and equipment shed, still in great shape. It wasn’t the first problem at Old Indiana – in 1996 the park was fined for 77 violations of child labor laws. There were also reports in the Indianapolis Star of animals, including a tiger, being treated inhumanely. The owners of Old Indiana Fun Park admitted negligence, but denied knowing anything about the condition of the ride prior to the accident. They have since declared bankruptcy, and most of the rides ath the park were auctioned on February 22, 1997. For example, the park’s log flume ride now sits in storage at Idlewild park in Latrobe, Pennsylvania. 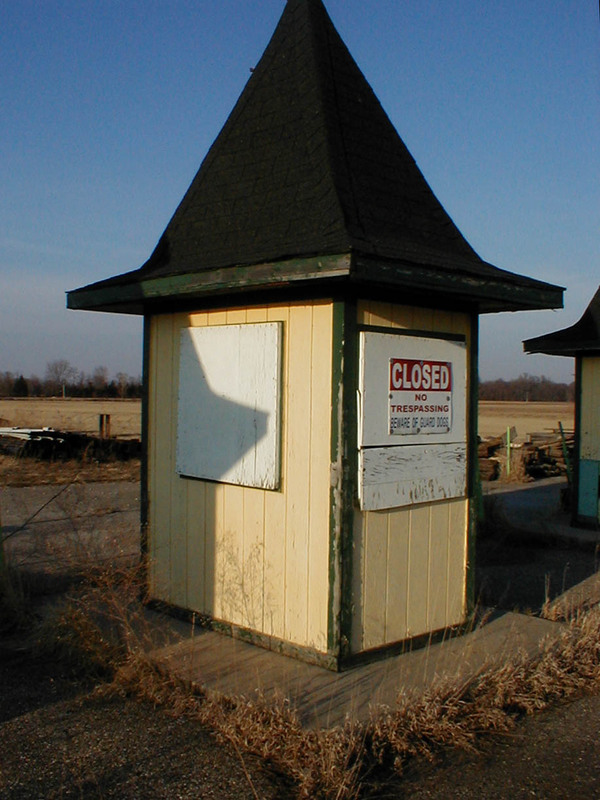 The parking lot entrance ticket shed, with disassembled ride in the foreground, and the main ticket windows in the distance. In fact, Six Flags began purchasing rides from other parks, and had several of them shipped to the site, including the “Screamin’ Delta Demon” from the now defunct Opryland USA theme park. These rides sit today rusting in the Indiana sun along with the remaining unsold rides from the Old Indiana Fun Park. The remains of a swing ride. 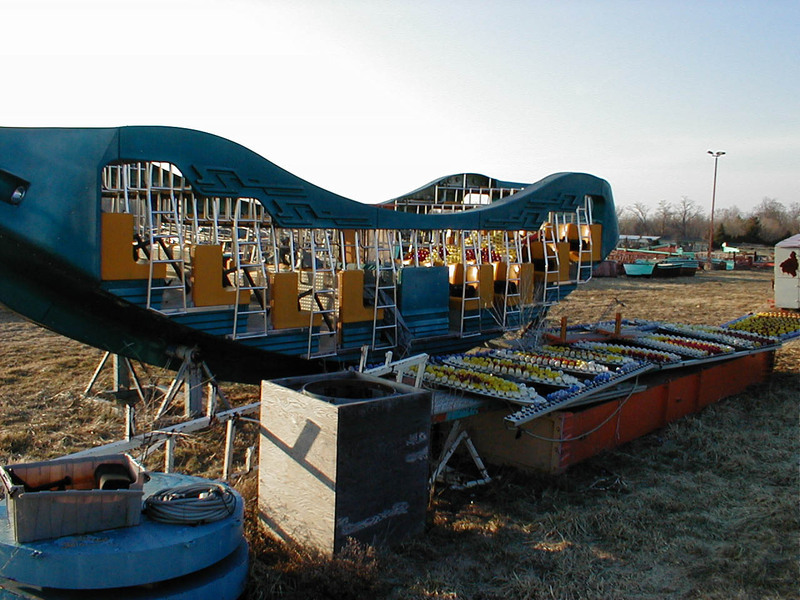 The net result of this tragedy, besides the bankruptcy of the Old Indiana Fun Park, was a law that toughened the regulation standards for amusement park rides, appropriately named “Emily’s Law”. The Emily Hunt Foundation holds “Emily’s Walk” each year to raise money for spinal cord research. The park is a little difficult to find now that all of the signs along the freeway are down. There is a large, painted-over green sign that still stands by the road as you travel south along I-65 – if you look to your right behind that sign, you’ll see the park. To the north of the park there is a defunct camp ground that is guarded by a large, black, hungry dog (at least in early winter 2001). The old main sign and the parking ‘field’. As you approach from the south, you’ll first see what appears to be a large, grassy field, until you notice the streetlamps dotting it and you realize it is actually a large, overgrown parking lot. To the north you’ll see a few remaining buildings, including the ticket windows, a red barn, the remains of a stage, and some support sheds. All of the rides are on the ground, disassembled into parts and neatly stacked. As you travel west, you can view almost all of these rides right from the road. 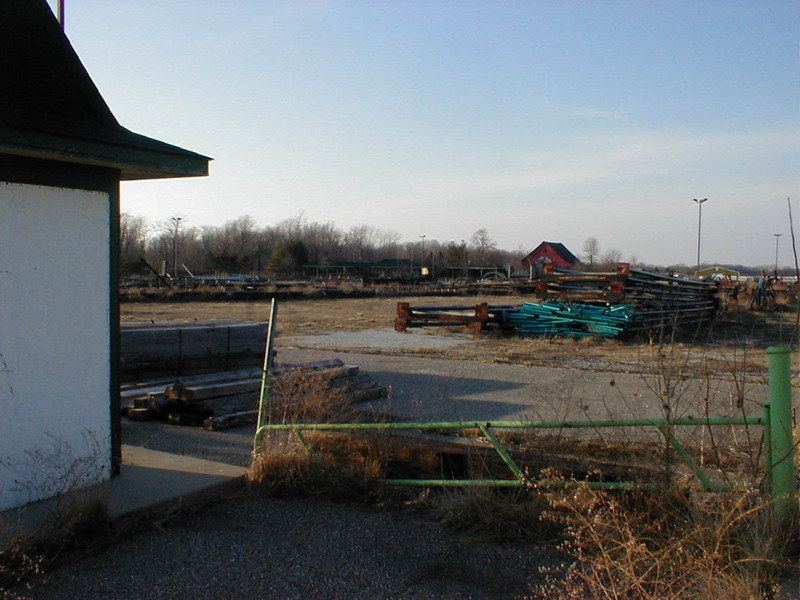 In the distance are visible remains of other rides and attractions, as well as parts of an old campground adjacent to the facility. What will become of the old place? Very hard to say. 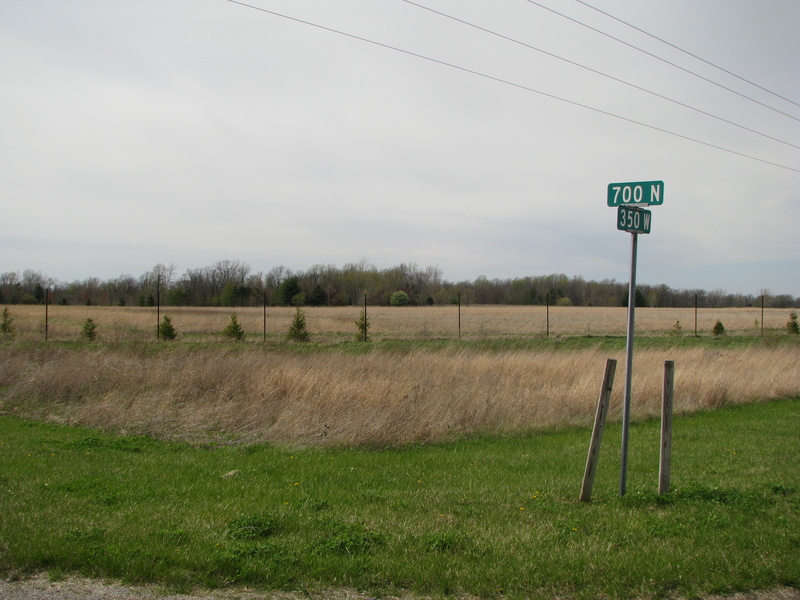 The location is a fairly good one – it is a little farther from Indianapolis than would be ideal, but the land is zoned properly, there are good utilities, and it is very close to the interstate. If the location can overcome the stigma associated with it, this park might rise again. 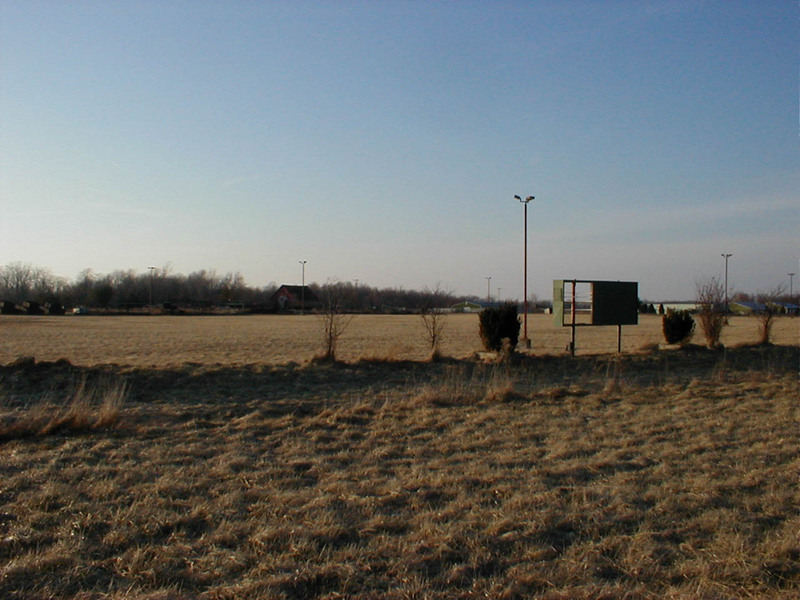 But with each passing month, the Indiana prairie will reclaim more and more of what once was the Old Indiana Fun Park. Six Flags bought the property shortly after this original story was written, but let it sit for six years without taking any action, except to use it as a storage facility for rides they hoped to one day install in a new park. 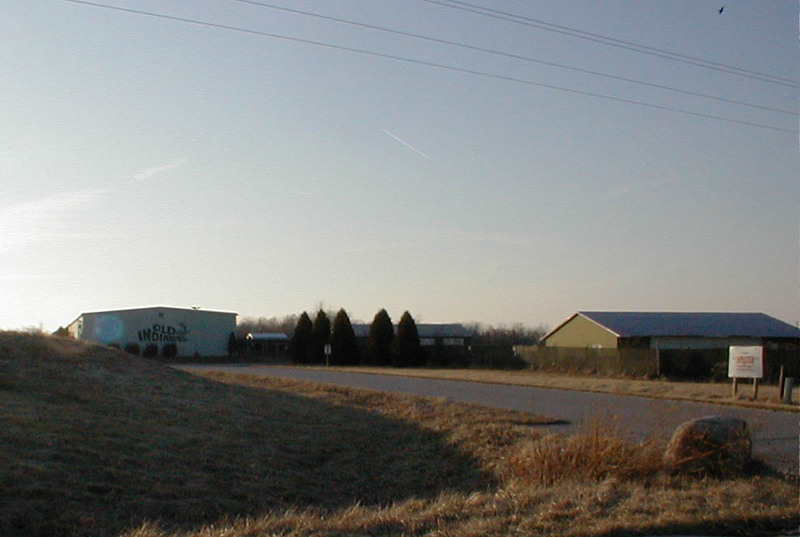 In July of 2002, the property was purchased by Trevor Grey, who owns an Indianapolis-based tanning bed and suntan lotion company named ETS (http://ETStan.com). He planed to create a nature preserve, and constructed a tall wire fence completely around the property. The majority of the smaller structures on the property, like the ticket booth above, are now gone. 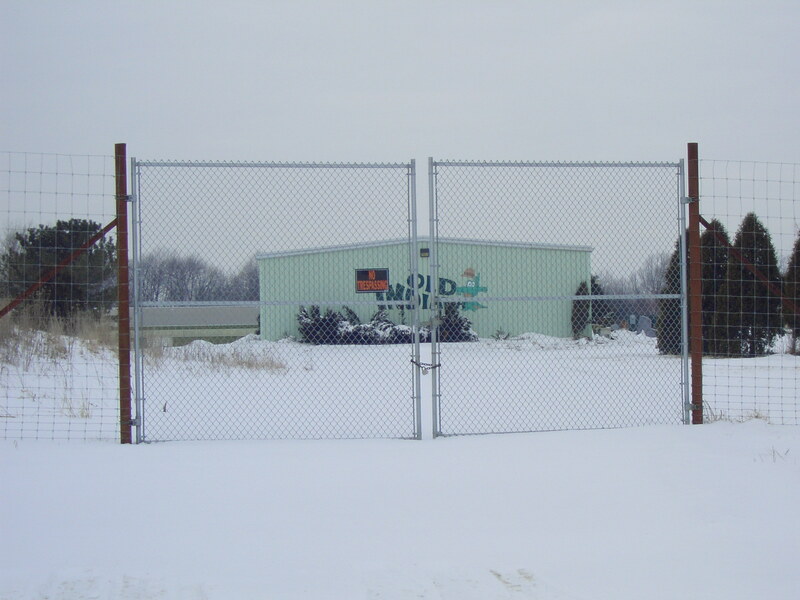 Front gate in February, 2003. As of April 2009, not much has changed. 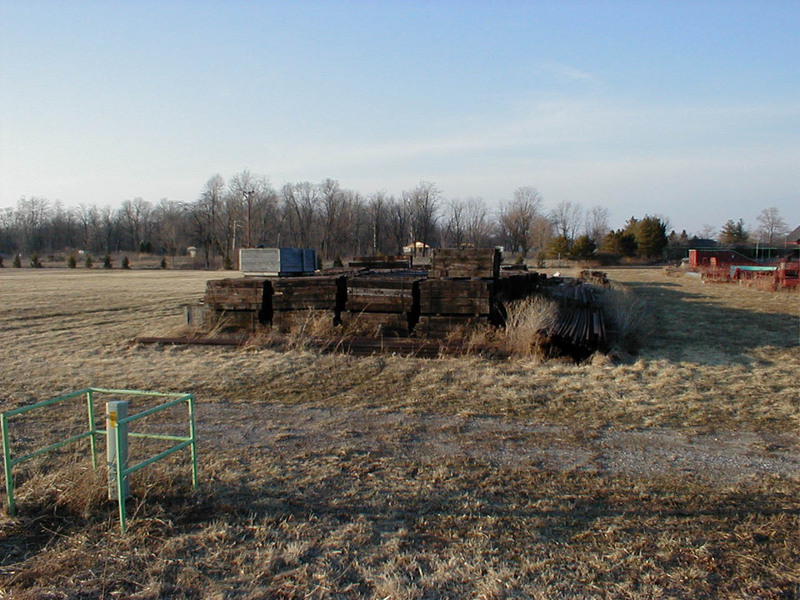 The same support buildings are still standing, and there are rumors that thousands of trees have been planted on the site – some of which clearly ring the property now. There is activity, however. Several pickup trucks passed by the corner while I took pictures, many more than would be expected so far out in the country. At least one stopped to ask me if I was “lost”. 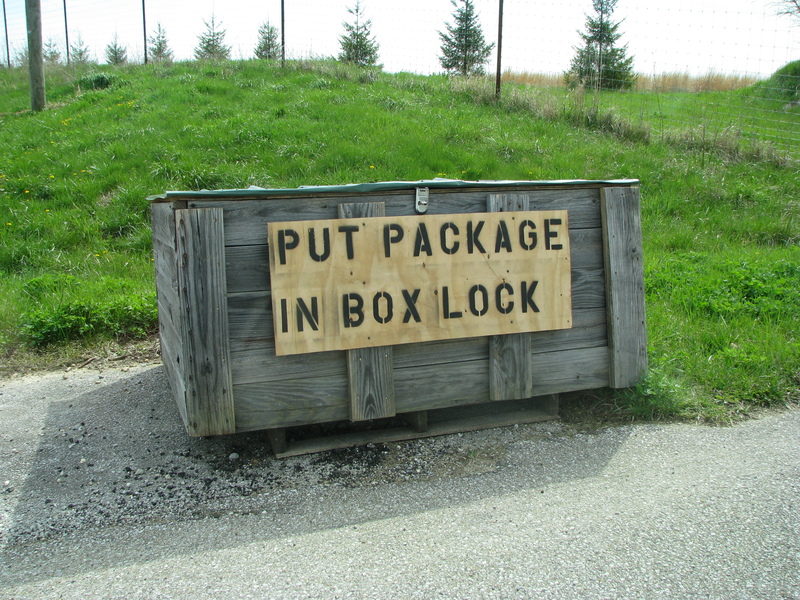 This interestingly-worded container has appeared outside the gates. This place will forever be part of my childhood. It is so tragic what became of it. Perhaps a nature preserve will be wonderful, but I will always remember Old Indiana Fun Park. The criminals that owned and operatored this death trap should be in jail to this day. Curse their greedy souls. Always remember the family that had so much pain because of them. Wow, I was just researching old Indiana, I wish I could have visited when the remains of the park were there for photograpghy purposes. I agree with Doug the owners who operated this location should be in prison and the “inspector” should be as well. Would love to see an updated story to see where the park is now and if anything has come of this locataion. the victim iss found partially responsible for some of their own injuries. board-certified. Assisted living communities are designed as home like atmospheres with apartment styles thst typically include studio and one bedroom models. Any theme park should have a contract for people to sign for accidents so they can’t be sued . People should know things can happen and know its at your own risks. I totally get the whole inspections she be at 100% but accidents do happen. After reading up a bit on this place, it was for the best it got shut down. The owners sound like evil people. Abusing animals, child labor law violations, rides which were not even remotely maintained and people getting killed and paralyzed as a result. This place is a hunting preserve trapping deer and other wildlife by the ten foot tall fence around it! Which I believe is illegal according to dnr. Glad I’m not the only one that sees it. I heard the year before I was hunting there he had exotic animals shipped in from other parts of country and world like moose and antelope for him and his buddies to hunt. Have been on this property a number of times. Yes there is a fence, yes they do hunt inside. There are no “imported” deer, or any other exotic wildlife, though. According to them they built it in consult with the DNR. I use to hunt deer up against that property. Trevor is not using it for a nature preserve. Lol. If he sees you out there he shoots guns blows up propane tanks and drives trucks through the farmers field that we had permission from. On top of that be careful not to get caught on his property. He has upwards of 10 “goons” that will find you because they have cameras al around the property. Once they find you they will hold you at gun point until sheriff, that lives on property, comes to arrest you. This is no nature preserve. It is a hunting grounds for Trevor and his goons. I’ve seen it first hand. Talk to the old farmer named loyd that owns the farmland north of sugar creek. It’s on the backside of old Indiana. You can see the farmers house from 65 as well. I wa there that day, working the roller coaster across they park. I was 18, it was a great place to work and the owners always treated us well. It was a tragic accident then and I worked the park right after the accident, I still remember the drop in visitors to the park, the lines disappeared, it was a sad ending to the park. I know it was so sad for that poor little girl and the elderly lady but I know being there it was an accident a terrible one but that park will always be a part of my childhood memories and I just remember hoping it would survive but it did not. How does on get ahold of the owner? Very interested in a sign that is posted by or on his property. There is now a hop farm where the old rides were located.